Mike McCormack is the award-winning author of five books, with Solar Bones, his latest, having been recently released by Tramp Press. I was born in London in 1965. I was born of Mayo parents who met over there - that generation of parents who emigrated from North Mayo. The only thing unique about my childhood really was that I was one of those children who was fostered out to my grandparents for a year or two, so I lived with them when my parents were in London. All my summers were spent there too, so the first pages of Solar Bones draws quite heavily on that experience. I then lived in Louisburgh and I was brought up there. I was an ordinary farm boy really. I came to Galway in the mid 80s; first in 1984 to study engineering, but it wasn't for me and I went back home. Then I turned up again the following year and started doing an Arts Degree. That's really it. Between hopping and trotting and one thing and the next, I've been in Galway since 1985. I was always bookish. Reading really was my passion. I started writing as an undergrad, although not very well. I used to live in the Cottage pub in Salthill. I used to live over the front door - there's a room over the front door, which is probably that wide, says he putting his two hands out, and it's about twice that width. I lived in that room for about three or four years. It was an education, living over a pub. I started writing in those years. This is in the early '90s. It was always fiction. Initially, my first book was short stories. I sent that out to publishers and it was just getting rejections and rejections and rejections, but I was very persistent. I just kept sending it out and sending it out. It got rejected 30 times, by which time I had pretty much all the publishing industry exhausted. So I started again at the beginning; I sent it to the very first one that I had sent it to. I thought, you never know, there might be a change. I was very obdurate. As it happened, there had been a change of editorial staff in Jonathan Cape between the first time I sent it out and almost two years later, the second time I sent it out. They liked it, but they said they couldn't go to their accountant with a book of short stories - there's nothing lower on the food chain than a first book of short stories. So they said, 'If you could tell us that you're writing a novel, that is something we could go with'. As it turns out, I had started a novel; I was about 20 pages into it. They said, 'Polish it up and send it to us' so I polished it up and sent it to them and I didn't hear anything for six weeks. I waited six weeks and my patience snapped one day. I was living in Prospect Hill at the time and I got a handful of 50ps and went down to the phone box that used to be outside Richardsons on Eyre Square. I rang up Jonathan Cape in London and said, 'Lads, have you made a decision?' and they said, 'Oh we just posted a letter to you'; this was in the days when people communicated by phones and letters and they said, 'We're going to buy the two books off you'. That was a very happy day. The money was trivial; I was 28 years of age, so money wasn't really the issue. That first book of short stories was Getting it in the Head, so that was published - it got great reviews and went on to win awards. My reputation was made as an exciting young writer with that book. I had difficulty then finishing my novel. I wasn't as skillful or as smart as I thought I was and it took me about a year longer than I thought. The book was scheduled to be out the following year, but it actually took two years to get out. Anyway, I got it out. Crowes Requiem divides people - there are some people who love it and there are some people who can hardly believe it was written by the same person who wrote Getting it in the Head. So that was the start really. It took another seven years before I published after that in 2007. "Patience underwrites every other talent you have. If you don't have patience, you're not going to write well. If you don't have the patience to keep coming back to a book and chiselling it and polishing it, it's not going to be good. If you don't have the patience to stomach rejection after rejection after rejection, you're not going to get published." What were you doing in between that time? I was writing. I was a writer in residence for two of those years in NUI Galway, I was doing bits and pieces of jobs here and there. It wasn't really an issue with me - I was a single man, I was on my own, I didn't really have any cares. Between my second book, Crowes Requiem, and my third book, which is Notes on a Coma - that took me seven years. That was a difficult book. The proposition I set myself as a writer in that book was just harder to pull off than I would have thought and it took me a lot longer. That book was eventually published and again, got very good reviews but it kind of dropped off the side of a cliff in terms of commerciality. That was the cause of me getting dropped from Jonathan Cape. I was about 40 years of age, and that's a difficult proposition as a middle aged man trying then to remake and restart a career - very, very difficult in the world of fiction. I published a book of short stories then in 2012, called Forensic Songs and that got a few reviews and that was it. All the time, I've been a self-employed teacher. I have to pick up bits and pieces of contracts here there and everywhere. So I teach writing in two colleges in Dublin. I teach writing in NUI Galway and I have students online in America, so that's how I keep body and soul together. All the time I was doing that I was writing another novel, the novel which became Solar Bones, and I had worked with the two ladies who make up Tramp Press - Lisa and Sarah. I had worked with them previously when they were interns at Lilliput, which brought out Forensic Songs. Then they broke away and formed their own publishing company. I submitted it to them because they had been great to work with at Lilliput Press. It was kind of a long shot. The book is an odd proposition, but I sent it to them anyway and within two weeks, they rang me up and said, 'We're coming to Galway; we'd love to take you out for something to eat'. So they brought me to Kai Cafe on Sea Road and they just said, 'Look, we love it, we'd love to publish it.' That was great. They spoke about it and it was evident they immediately understood the book; the book is a continuous outpour by a ghost engineer back from the dead to visit his own house. They published it six weeks ago. The reviews have been very favourable - people have said nice things about it. How do you deal with the negative reviews? Have you become more resilient as time's gone on? I was spoilt with my first book which got good reviews right across the board. So the very first review of my very first novel. It was published on a Friday and so the reviews were on Saturday. I went down to Easons and picked up the London Telegraph, because I was told a review was coming out, and that first review of my first novel, was, and remains to this day, I think the worst review I've ever seen of a book. It was terrible. The critic started off by saying that he could think of nothing good to say about the book and then it got worse after that. That was devastating. But actually, three reviews came out that day. There was one in the Times and one in the TLS (Times Literary Supplement) that came out that day and they were very good reviews, so the score was two to one at the end of the day. I remember when I was starting out and hanging out with another writer and we were both talking about getting reviews and John Banville was reviewed around the same time and he said he didn't read them any more, that he didn't really pay that much heed or attention to them anymore. Us, as young writers, were saying, 'That's nonsense - first thing on a Saturday, you're up out of bed to see who's reviewed your book and you're avid for it'. But I'm coming around more to John's thinking. I asked my wife, Maeve Curtis, she's a painter and she sometimes gets them before me and I ask; is it a good review or a bad review? If it's a good review, grand, if it's a bad review, sometimes I read them and sometimes I don't. One of the things that's really interesting about the current reviewing climate is that some of the best reviews of the book, and I don't mean best in terms of a favourable verdict, but I mean in terms of analysis and engagement, have been online blogs. One is Bookmunch, where there's a very interesting review of the book, a very engaged review of it - much better than some of the print reviews in many ways. I was talking to someone in New York who said it's now the belief among literary people that some of the best reviews are not in the New York Times Book Review and other places, but that there's equally good book reviews by passionate bloggers who write for no other reason than their own passion and who've generated their own audience. You're a prime example of somebody that didn't give up, was it that you really believed in what you were doing or you were just stubborn? All of those things - a mulish streak that's always a great asset to any artist. I rightly or wrongly believed that I had something new to say or could say an old thing in a different way and that it was only a matter of time before people came around to appreciating it. I teach creative writing - young poets and young fiction writers - and one thing I had was great patience and stickability. Patience underwrites every other talent you have. If you don't have patience, you're not going to write well. If you don't have the patience to keep coming back to a book and chiselling it and polishing it, it's not going to be good. If you don't have the patience to stomach rejection after rejection after rejection, you're not going to get published. So I had great patience as well. It's about as unglamorous a gift as any writer has but every other gift is grounded in it, in patience. It's one of the more difficult things to teach young writers. Take your time, have patience. The generation behind me, they clip long at a different pace; they live in a more immediate world I think and they live in a world in which responses are much quicker. So they don't really have the long wait thing that people of my generation have and it can be difficult, because being a writer is a tough job and it can be a difficult thing to get them to wait. I suppose it's one of the things, as a teacher that gave me authority in a classroom, was the fact that I can say, 'Look, I can tell you what it's like to have your book rejected 30 times. That book then goes onto be published and wins a claim. But you have to stick a really long period of rejection and refusal before you get it'. Patience and a degree of self belief and a mulish streak are necessary. Of all the books that you've written, which was the most enjoyable to write? The most enjoyable one was Solar Bones, my recent one, because I don't remember a thing about writing it. I'll tell you why. I've been interviewed a couple of times about this book and it's only when people have asked me that I realise how little of it I remember, and it's only in the last week or two that I've heard a writer say the exact same thing. I spent about five years writing it. But, when I was interviewed about the book, I found that I couldn't remember much about it at all and that's really unusual, because I can remember every moment of every other book. I can remember the great sense of exploration that there was in writing my first book and realising, 'you can do this, this is a good story you've written'. And I can remember the difficulties with my second book. I can remember where I wrote it - Prospect Hill, Romania, Louisburg. The third book, I can remember that book very vividly, I can remember it took so long. I remember standing talking with my friend, a painter, saying to her, 'I haven't a clue what I'm doing with this book'. Fourth book, I can remember all the individual stories and the way they were put together. Fifth book, no. Here's why. I sent the book to my publisher at half two in the morning, and about seven or eight hours later, got into the car with Meave, went into the hospital and I became a dad another hour after that. So part of Saul, the birth of our little boy, seems to have obliterated the whole experience. I can remember that morning so vividly. It's the male version of baby brain. So when you ask me, what was my favorite book to write, all I can say is that I have no memory of the torment that I went through with some of the others when I was writing Solar Bones. So where does the drive come from to write and keep on going with it? There's loads of things that prompt you and inspire you. As I say, I was always bookish, I was a farm boy in Louisburg and I used to read so many books. In my teens, I used to read my dad's westerns and I used to read Flann O'Brien and read Isaac Asimov's science fiction, and I thought it was a marvellous thing; to be sitting beside the range in Louisburg and your head could be on Mars or you could be in the Mojave Desert with the cowboys or you could be in one of those parallel worlds that Flann O'Brien constructed. I thought it was a marvellous thing to be able to do that I just covered it. I said, 'I can't play football like Maradona and I'm not likely to have my own heavy metal band, so what else would I do? And I thought, I'd love to be able to do this. And that's still one of the guiding enchantments. One of the things that now keeps me coming back to the desk is, the older I get, the more astonished I get at the fact that I'm alive at all and the odds against me being here as I am are so hopelessly stacked against it. But here I am, and right at the bottom of all our existance is this astonishment and just to try and the thought that as a writer, you might be able to put some dramatic shape on it. That's what keeps me coming back, as a fiction writer and a novelist. That's what keeps me coming back to the table every day. Although I wish I did get to do it every day, but writers get to build up rhythms. It's like you jog along for a couple of weeks, then something happens in your life and you get thrown out of it. It's like going to the gym, you' keep it up for two or three weeks and then something happens and it throws you out. It's very much the same way. How does Galway inspire you and has Galway inspired you over the years? Galway was a huge influence on me. Speaking about this in another context. I'm a writer, but when I graduated from university I fell among visual artists. All my twenties, I lived with painters, sculptors, photographers, because Galway is full of visual artists. I got a literary education from both myself and my time at university, but I got an equally valuable visual arts education from people that I shared houses with for years, people that still practice today. Cyril Briscoe is still practicing, Noelle Donnalena still practices. Then I went on and married an artist, Maeve Curtis. Visual arts are a Galway signature and I just happened to be in the middle of it from the age of about 20. From 20 to 30, I was way more familiar with visual arts than with the writing culture in the city. How do you find it now as a place to live as a writer? Tommy Tiernan launched Solar Bones and he made a great point. He said I was the class of '88 - he himself was the class of '88. That class that was here in Galway. We were on the dole and we were working keeping body and soul together with other under-the-counter jobs. But actually, we were all writing books, or putting on plays or we were all in bands. We were young men and women in a city with bohemian pretensions, and properly doing that. It was an incredibly valuable time, in your 20s to be doing nothing like that, to be able to be getting your thoughts together, your head together. Someone pointed that out to me, he said; 'You were the last generation that had time to get your head together' and I said, 'You could be right'. I think the world took off at a faster clip after that. The city kind of turned a blind eye to you in many ways - benevolent neglect was more the attitude of the city at the time. They just let you get on with it, they didn't hassle you.This collusion between ourselves and the dole office that they knew you were doing nothing and they left you at it. Galway at the time in the 90s was spoken of with awe and reverence by a generation of young people that were trying to get their heads together and projects together. Someone was telling me that at Glastonbury, back then in the 90s, there used to be fliers and handouts about how to get to Galway for a generation looking to live a bohemian life. I wonder is it that tolerant any more? I wonder is it that lackadaisical anymore? There was space created for you. In some sense, it was so relaxed that people just kind of dissolved in it that their will to do anything just got sapped by it being so cushy and an awful lot of people, a lot of them gifted, just dissolved into drink and talk. But I was saved from drink because I didn't have enough money to buy it. I just wonder what it's like to be in your 20s here now. Or is there much more of a pressure on you? "Galway owes a whole heap to young kids in their early 20s who pretty much made the reputation of this city and there's a whole generation of them. Kids in woolen jumpers and doc martins who built theatre companies, built galleries, put together artist collectives"
There seems to be much more battling for mental creative space. During our time, there was a collusion between you and the city in many ways. 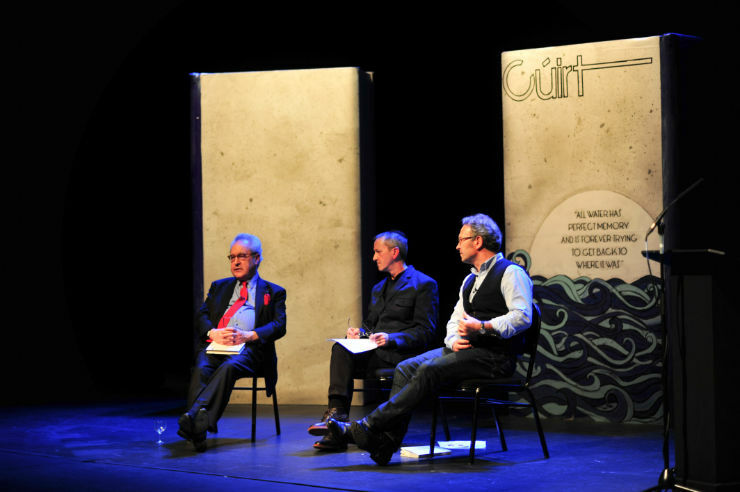 Fintan O'Toole made that point about Galway and that generation of people like Padraic Breathnach and he referred to them as 'a generation of gifted wasters', and I can see both ends of that statement. That's in many ways what some of us were. It's very difficult to explain it to people at the time who were working 9 to 5 and were raising families. It was a valuable experience, but there were a lot of casualties - an awful lot of people get stuck in it and don't get careers. There's an awful lot of single people in that generation behind me who never married and settled down. Living a bohemian life, it can take you a long time to get around to those adult things properly in which you can build marriage and family around. I moved out of the city about seven or eight years ago to the Cappagh Road, so I don't have that kind of intimacy with it that I used to have, the continual going to exhibitions and going to Charlie Byrnes. I've grown out of it; middle age catches up on you really quickly. What would you like to see happen for the city going forward? I'd love to see the political class and merchant class properly engaging with the necessity for proper art facilities in the city. It is my belief that the merchant class, the administrative class and the political class have had a cultural life on the cheap. They've got it on the back of a massive volunteer class that are all in their early 20s and that there's all sorts of functions and openings but it's always young people thinking on their feet and devoting time to it. This is a city with artistic pretensions that doesn't have a proper gallery. You used the phrase 'mental space', there isn't a public civic gallery space for instance where people can go in and sit and contemplate a painting. There's no open space like that. 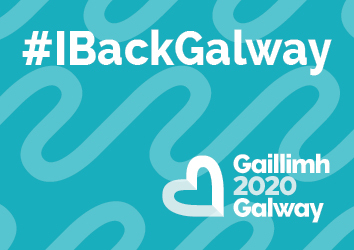 It's because of the demographics in this city, Galway owes a whole heap to young kids in their early 20s who pretty much made the reputation of this city and there's a whole generation of them. Kids in woolen jumpers and doc martins who built theatre companies, built galleries, put together artist collectives. I think there's two artist collectives in the city - they're always jostling for space, they've never been rewarded with a proper gallery space. It would be nice to see the merchant class and the political class living up to its own creed as a city of culture. That's really what I would wish for Galway going forward. Generally quiet but sometimes a cranky whore. This interview was originally published on A Tribal Vision - read the original interview at http://atribalvision.com/interviews/052-mike-mccormack. All text is copyright A Tribal Vision. Images are copyright of their original owners.